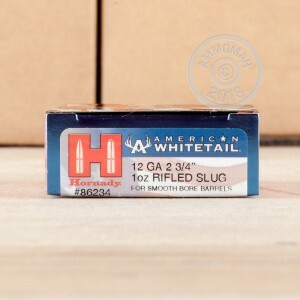 Hornady American Whitetail Rifled Slugs are a great choice for deer hunting with your smooth bore shotgun. 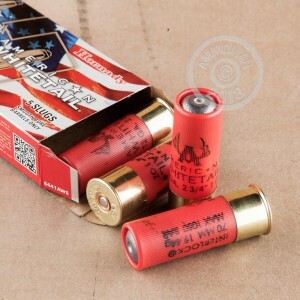 Each shell packs a 1 oz rifled foster slug, for quickly dropping those big bucks! Hornady's premium hunting rounds have become a staple, recognized by hunters around the world for their accuracy and reliability. 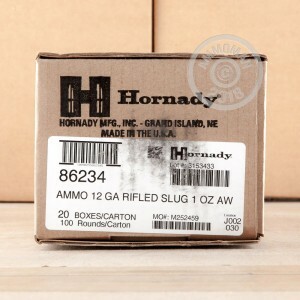 Grab a few boxes before your next hunt and remember, all orders over $99 always ship for free from AmmoMan.com. Went to the range 2 days ago shot off about 32 from my DP12. Started at 15 yards nice and accurate, recoil was manageable, then went to 20 yards still very accurate. Only problem was they are smokey. Lots of fumes from this so if you're at an indoor range you might have to wait for the smoke to clear after about 3 shots.